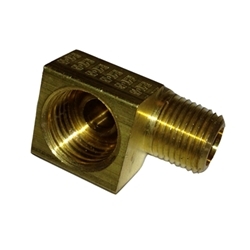 Fitting, brass 90 deg. This fitting is correct for the carburator, fuel pump and fuel filter assy. 1/8th pipe /flared. Fitting, brass 90 deg. This fitting is correct for the carburator, fuel pump and fuel filter assy. 1/8th pipe/flared.